One more year, Barcelone hosts the Mobile World Congress (MWC19), the biggest event for the mobile industry. The 2019 edition will be from February 25th to February 28th. Last year, the world’s largest exhibition for the mobile industry attracted 107 000 visitors and raised about 471 millions. This year, it seems that, for the first time, the historical maximum of 108 000 visitors (2017) will be exceeded. For this reason, the city of Barcelone is already prepared for the avalanche of executives and experts who will visit the city coming around the world. Transport, hotels and, of course, holiday apartments in Barcelona… All of them are ready for the MWC19. If you’re one of the more than 100,000 attendees expected from the organisation, from MH Apartments we give you some keys to move around the congress. If you are preparing your visit to Barcelona to attend the Mobile World Congress 2019, we advise you to to be aware of all the latest news of the MWC 2019 from its official website. In this way you can take advantage of your days both in the congress and in the city, and it’s algo a good opportunity to enjoy all the nighttime activities in Barcelona. This year, the main theme is called “Intelligent Connectivity”. If you do not want to miss anything, we strongly recommend you to have your conference program and mark your priorities. The MCW19 offers many interesting conferences. This year, some of the keynote speakers are James Forese, president of Citigroup; Anjali Sud (Vimeo CEO); or Rick Williams (Groupon CEO). In addition, more than 2400 companies will attend the event. The MWC19 includes other events related to the technology and innovation sectors will be held: ‘Youth Mobile Festival‘ (YoMo), ‘NEXTech, ‘Women4Tech‘ and ‘4YFN‘ (Four Years From Now). Otherwise special devices will be deployed throughout the city, especially at the airport, the main train station and hotel areas. The entrance to the exhibition will be slower due to security measures, so we recommend you to going early. The GSMA, the organizer of the congress, has enabled several points in the city to speed up the accreditation system for the Mobile World Congress. The Sants station, the airport, Passeig de Gràcia (near Gran Via) also serve as collection points for tickets for the MWC, in addition to the main one you will find at Fira Gran Via. From MH Apartments we put at your disposal all our apartments in Barcelona for the MWC17, fully equipped so that you only have to worry about relaxing on your arrival. We have our own buildings, so if you come from a business trip or with your entire company you can stay in the same location. In addition you will enjoy an exceptional situation well communicated and in the best areas of Barcelona. As every year, the Mobile World Congress is celebrated in two different places of the Fira de Barcelona: Fira Gran Via and Fira Montjuïc. Most conferences, seminars and exhibitions take place at Fira Gran Via. The organization is responsible for distributing a special fleet of buses to various parts of the city to take visitors to the venues. However, if you want to arrive by public transport you can take the metro with the new lines L9 Sud and L8, which leave you directly ahead (‘Fira’ stop) from the city center or even the airport. 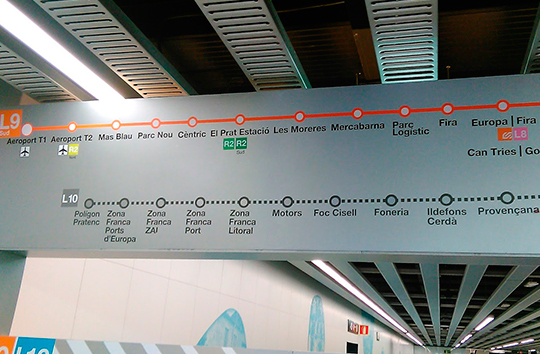 You can also go by metro to the ‘Espanya’ stop – L1 (red) and L3 (green) lines – and then connect with the Ferrocarrils de la Generalitat de Catalunya (FGC) to ‘Europa / Fira’. Also from Plaza Espanya there are several buses (H12, 45, 65, 79, L70, L72, L86 and L87) that you can take to the ‘Plaça Europa’ stop. Another option is to take a taxi from anywhere in the city. The trip will cost you about 10€ from Plaza Espanya and about 30€ from the airport. It will be easy to find a place to eat well for the attendees this year, because L’Hospitalet de Llobregat City Hall organizes at the same Europa square (just in front of the fairground) the ‘Village L’H Experience‘: there is a tent of 400m2 in which eight restaurants of Barcelona offer dishes with proximity products as calçots (green onions), botifarra (sausage) or the artichoke Prat. In addition there will also be musical and traditional performances as castellers or gegants. In addition we encourage you to discover the city by visiting the multitude of restaurants and bars that you will find around your accommodation in Barcelona for the Mobile World Congress.